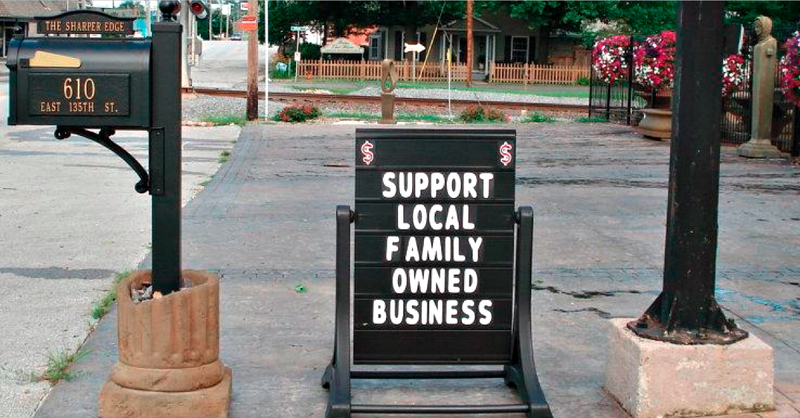 Long-time business owner believes in bringing out the best. Scott Rutledge is as much a part of Martin City as the sound of trains passing by next door to his business, The Sharper Edge. He’s also a shining example of the entrepreneurial spirit we have in Martin City with his relentless determination and commitment to doing things better. Scott’s the kind of guy who knows how to get things done right and if he doesn’t, he’ll do his homework and keep trying until he figures it out. He opened his doors in Martin City more than a decade ago, about the same time the area’s community improvement efforts started picking up momentum, and he’s been a champion of the District ever since. When Scott was mowing lawns for money at age 12, he didn’t know what his future looked like, but he was already starting to understand the road ahead would be paved by hard work. That road would take him through college, military service, and a corporate sales job that quickly showed him he wasn’t meant for boardrooms and cubicles! “I remember sitting at the office, looking out the window and just being envious of the guys mowing the grass and trimming the trees outside, and wondering what it would be like to do a hands-on job that makes you truly happy.” Scott started looking for better options. Surprisingly, something he noticed on vacation in California caught his eye and evolved into a business idea back home. “I kept seeing really cool concrete edging over and over again. I thought it would be nice to have it at my own home, so when I got back in town, I looked around and discovered it was hard to find in this area.” That’s when he had a life-changing epiphany. The Sharper Edge enabled Scott to leave his corporate job and put him on the road delivering high-quality concrete edging products and services to homes across Kansas City. He labored during the day and traveled around giving estimates at homes in the evening until the mobile operation wore him out. That’s when he bought property for a permanent location, just east of the train tracks on 135th Street in Martin City. The 2005 purchase immediately presented new challenges. The Sharper Edge property where the Mobil gas station once stood. The Sharper Edge finally opened their retail store in 2007 and Scott continued to sharpen his focus on pioneering the best concrete edging service in the Greater Kansas City area. Other entrepreneurs tried to get in on the idea, but tactics, like buying cheap start-up kits off the internet, and cutting a lot of corners, quickly weeded them out. “There’s no secret sauce. It’s just very high-quality, seamless, continuous concrete carefully poured into the ground with a hand-crafted finish. We strengthen it even more with a stainless steel cable through the core. An office file full of thank you notes. Referrals account for 80% of new business. Scott is constantly turning to technology to find efficiencies and better ways to serve customers. If you give him a call, you might be surprised at how much he can quickly figure out about your property, thanks in part to Google Maps, which allows him to calculate dimensions and give immediate ballpark estimates. It’s not the kind of edging product or personalized service you’re likely to get from a garden store chain. In fact, garden stores aren’t really even competitors because the product is custom made on site by skilled tradesmen. Wander around The Sharper Edge showroom and retail center and you’ll find all kinds of interesting concrete landscape decor to compliment edging, and an array of creative statues and fountains. The fountains are quite an attraction for customers, but these days, the demand for hydroponics supplies at The Sharper Edge is extraordinary. Scott says hydroponics keep customers coming through the doors year round and he doesn’t see it slowing down anytime soon. “People are concerned about how their food is being grown commercially, especially with chemicals. They want to grow their own to some extent, and also just be able to experience a little nature. Being able to grow indoors is really convenient. So we decided to become the go-to supplier for those customers. When Scott began overhauling his property back in 2005, there were no community improvement awards, just a neighborhood trying to revitalize itself with the help of people like himself. And he took the job seriously. “We didn’t just come in here and slap on a coat of paint and patch some holes. We really did it right. We took this building down to the bones, and then we ripped the floors out and put in new sewer lines,” said Scott. Scott’s property also included a two-story house next door that sat vacant for years until he jumped in to bring the old structure back to life with his trademark ambition and the money to back it up. “I replaced all of the plumbing and electrical, and I gave it air conditioning for the first time with a high-efficiency heating and cooling system. Everything was done to exact standards,” said Scott. Thanks to his efforts, what’s believed to be the oldest house still standing along this stretch of 135th Street is now the home of Gilded Lily, a charming antique boutique rich with vintage character. Scott’s revitalization efforts have given Martin City a special energy and we appreciate him pitching in to help our community when he can, like the time he found the right contractor to string up the holiday lights around the District! You may also find him at our monthly CID board and other community development meetings, adding his voice where he can to help shape a positive future for Martin City, a place he fully expects to be part of for many years to come. The Sharper Edge has a long list of specialty products (over 5000 items, some in stock, some special order) which are tough to find locally. 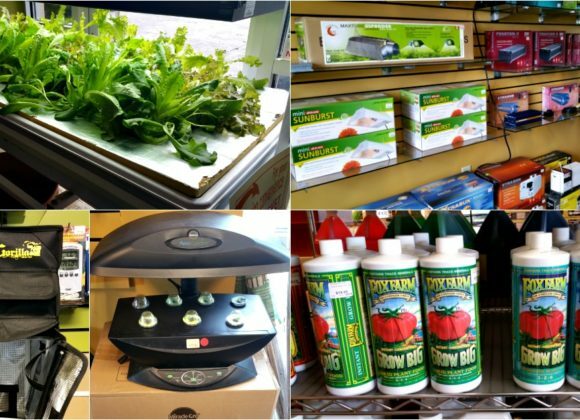 Product lines are targeted to both hydroponic and dirt gardeners with a strong focus on the organic growing of vegetables, and they are the only store south of I-70 to have this offering. Stop by and pick up a free catalog or join their Facebook community.